If you’re looking for a chic and can make a solid cup of tea or pour over coffee, try the Secura Electric Gooseneck Kettle. If you’re looking for a solid electric kettle that boils your water perfectly every time, then the Cosori Electric Glass Kettle CO171-GK is the one for you. Boiling water has its purposes. In the past, before water was ever filtered, people would boil it to remove impurities and other things that could harm the body. But then people discovered you can add flavorings to it and then tea started to take off. And for centuries, people from all over the world have been drinking tea. As this was happening, the way in which people boiled water changed, too. And soon different variations of the kettle started to crop up around the globe. And while many people, especially in the United States, have grown very accustomed to heating a kettle on the stove or even popping it in the microwave, countries like the United Kingdom, have been using electric kettles for years. But after reading this post, hopefully, that will change. After through all the types of electric kettles out there, we have picked out five of the best ones. 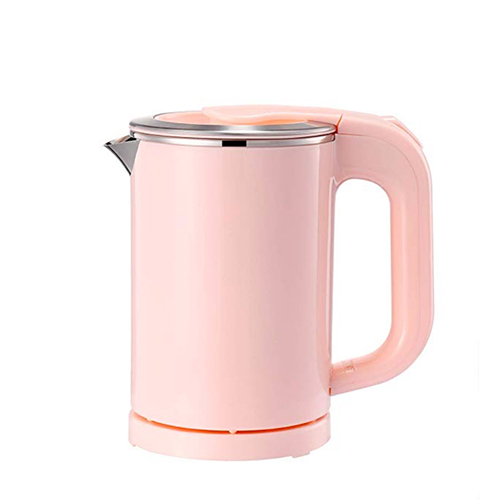 From ones that make the perfect cup of tea to the one that’s perfect for the tight budget, one of these electric kettles will be a great addition to your home. 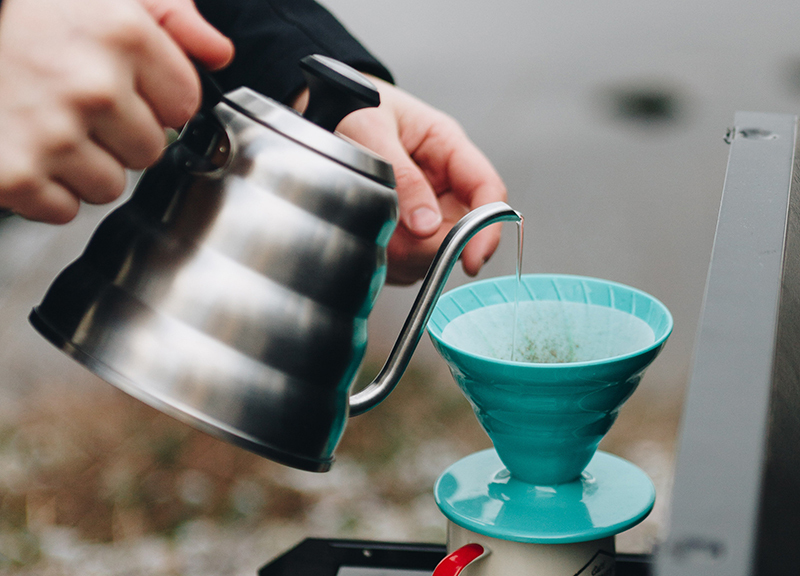 Learn more about the top 5 electric kettles below. If you ask anyone with an electric kettle which one they have, it will likely be the Cuisinart CPK-17 PerfecTemp. Not can it hold up to 1.7 liters of water, it has a variety of temperature settings based on what kind of tea you’ve decided to drink. It also has a feature that will keep it at the same temperature for 30 minutes. That way, you don’t need to wait so long to make a second cup of tea. And if tea isn’t your thing, you can also select the French Press option for some coffee instead. Six Presets Temperatures: From Oolong to French Press, you can select the right temperature for the perfect cup. 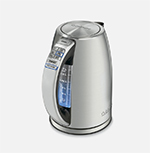 Keep Warm Option: The kettle will keep your water warm for up to 30 minutes without restarting it. Memory: There is a memory feature that won’t forget its place in the brewing process. Leakage: It can leak due to constant use over time. Complicated: It can be complicated if you’re just looking for a simple cup of tea. If you’re tired of turning on the stove and waiting for the high-pitched steamy sound, then you definitely should consider getting into electric kettles. And if you’re on a budget, then give the Ovente electric kettle a try. Although it might not have any temperature presets, it does guarantee to heat up your water in no more than seven minutes. And if it’s ready but you’re not, don’t worry. The Ovente electric kettle has an automatic shut-off feature and boil-dry protection technology. So it’s also a safe one to use. Budget Friendly: At $21.00, it doesn’t cost much. Boil-dry Protection: In case all the water evaporates in the kettle, the device is protected from burning the heating surface of the kettle. Tidy cords: The cord wraps around the base so it keeps your counter uncluttered. Big: The oblong shape can be bulky on your counter. Doesn’t Stay Hot: Water cools fairly quickly. Hard Cord: The cord isn’t malleable, which makes it a little difficult to tuck away. Don’t want a bulky electric kettle to take up prime real estate on your kitchen counter? Then maybe you should look into getting the BonNoces portable electric kettle. It has a half liter capacity, which makes it ideal for travel or even for your office desk. Since it only uses 800 watts, it doesn’t use so much electricity to power. It also can heat up your water in five minutes. This particular kettle also won’t be whistling and making a lot of noise either. Compact: At half a liter, this is a small kettle. Travel Friendly: Since it’s small, this one is easy to pack into your suitcase. Quick to Boil: It boils water in five minutes. Hard to Find: It’s not available at many retailers. Wears Easily: It’s not the most durable. Constant Cleaning: It needs to be cleaned a lot. 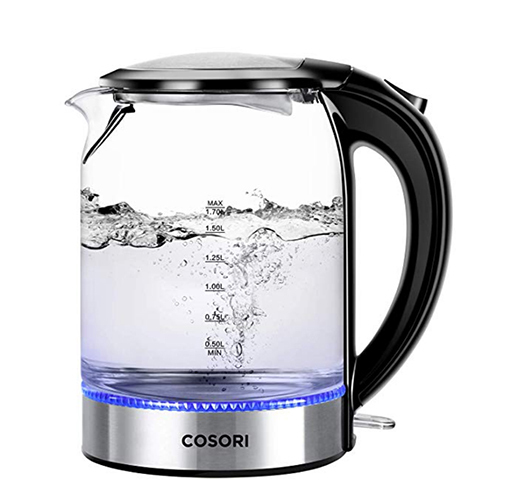 If you’re looking for a simple electric kettle that doesn’t come with too many frills, then you should consider the Cosori electric glass kettle. First, it holds 1.7 liters and can boil that water between three to seven minutes. There’s a stainless steel filter which makes sure no random particles get into your tea or coffee. It’s easy to hold and even easier to turn on. Wide Mouth: The kettle’s opening is wide and makes it easy to clean. Quick Boiling: The kettle heats water between three to seven minutes. Automatically Stops: Once the water is the right temperature, it shuts off automatically. Oversized: While it holds a lot of water, it’s shape can take up a lot of room on your kitchen counter. Plastic Parts: Even though it looks like it, the kettle has plastic components aside from glass and steel. Odor: Sometimes it gives off a plastic smell. If you’re really into your tea and pour over coffees, then a gooseneck electric kettle may be the right one for you. And the Secura Electric gooseneck kettle is perfect. One of the biggest reasons you’ll see coffeeshops opt for the gooseneck kettles is because it gives you the ultimate pour control. Because of the pathway the water needs to take to leave the kettle, it helps to avoid over-pouring. Not only does the Secura help with that, but it also heats up your water in six minutes or less. The handle design takes stress away from your wrists, and There are also eight temperature settings that range from 100 100°F to 212°F and also keeps your water warm for 30 minutes. Ergonomic Handle: The handle’s design will put less stress on your wrists. Gooseneck Spout: The long thin spout gives you more control over your pouring. Boils Water Quickly: Hot water will be ready between two to six minutes. Volume: It can be loud. Short Cord: The cord can be too short. Size: This kettle is known to take some room on your counter. While a traditional kettle looks like a sweet addition to your kitchen, waiting for it to heat up can make you feel like you’re waiting forever for that hot cup of tea. If you’ve been feeling that way, then it might time to trade in your old kettle for an electric one. While it might seem simple, there are a number of things to consider. Below is a little list of features to think about when picking the right electric kettle for yuo. 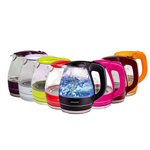 Electric kettles come in a variety of shapes, sizes and colors. And more importantly, they are also made of different materials. Learn more about these materials below. Plastic: This is one of the more common ones you will see. While outer parts are made of plastic, the components inside, especially the heating element, are still made of metal. Usually these models are more affordable. Stainless Steel: Stainless steel electric kettles have been more common in offices for its simple yet no frills look. If that’s more of your style, just be careful taking it off its heating pad. Like traditional stovetop kettles, the sides get as hot as the water inside so always pick it up by the handle. Glass: Glass kettles have been growing in popularity for its modern look. And some people really enjoy the ones with the LED blue lights in the kettle to signify that the appliance is working its magic. But like other glass objects, this is probably the most delicate of all the electric kettle materials. 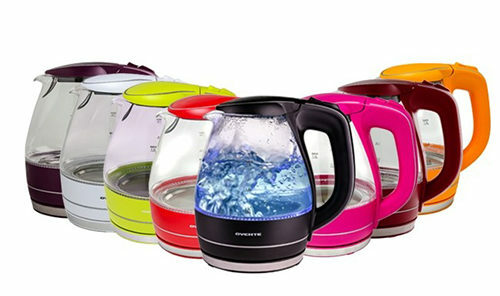 Electric kettles come in a variety of wattages. Some use more power than others. So how fast your water will boil completely depends on the power that you should also be sure to know. The average electric kettle is 1200 watts. But there are also models that use up to 1500 watts. So if you’re don’t want to add an extra bump to your electric bill, be sure to check how many watts your kettle will use up. There are a variety of electric kettle looks. 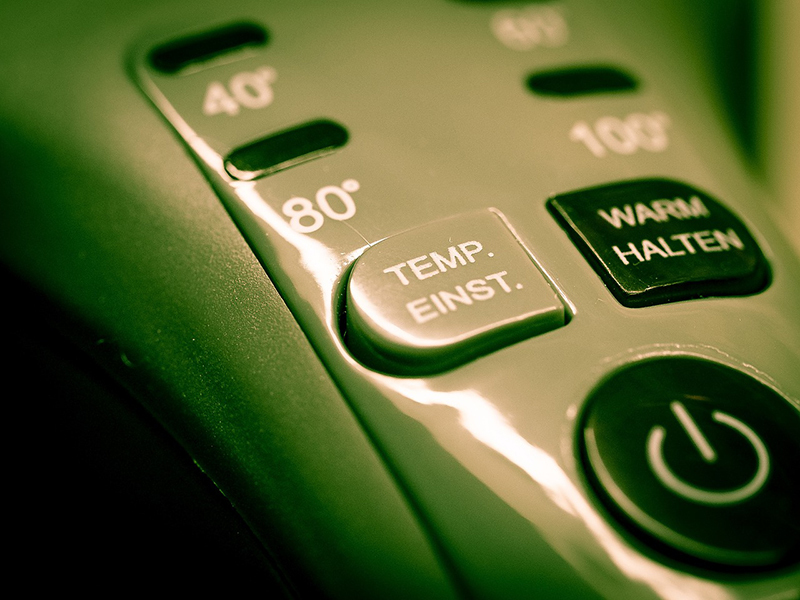 However, there are also a variety of temperatures that an electric kettle can offer. Depending on the model, there are some that will heat up the water based on the type of beverage. Others will also give you the ability to set the exact temperature you want your water to be at. 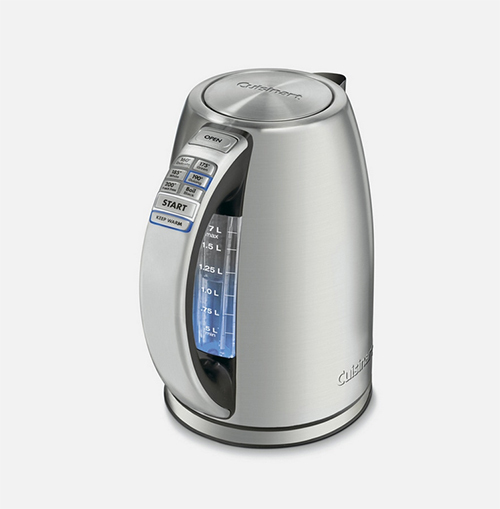 For the most part, electric kettles carry about 1.5 liters of water. 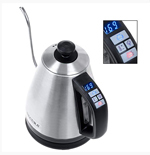 However, there are other electric kettles that can also hold a smaller amount of liquid like one liter or even less. So depending on how much you need boiling water for your drinks or a hot water bottle, then that will dictate which of the electric kettles you should have. Since electric kettles are lifted off on and the heating platform, they have to be built with some durability. However depending on the make, materials and usage, that will determine how long one kettle will last you. So if you’re looking for something that’s durable, you may have to spend a little bit more. Water is meant to be clear and clean. However, if you’re getting water from the tap, it’s likely to have some minerals in there that can collect inside your kettle after a period of usage. But don’t worry. First, that’s pretty normal. And second, there are some ways to take that gunk out. While there are cleaning solutions meant for your electric kettle, some of you might want something a bit more natural and less chemical. The first method is a “swish-and-swirl” cleaning. Toss in a few tablespoons of baking soda. Then add in a quarter inch of apple cider or white vinegar to cover the baking soda. Let it bubble up for 30 seconds. Swirl it around so the mixture can rub some of the minerals off then pour it out. Follow with some water and to wash the excess vinegar and baking soda out. You can also use the steam method. Pour one part apple cider or white vinegar to four parts water. Turn on the kettle and let the steam fill the pot. Then after steam fills the pot, swirl it around and take a dishcloth that has baking soda on it to wipe the insides of the kettle. Electric kettles usually have a one to two year warranty. But in order to opt into that, you will need to register your product to the company. Also, some retailers, like Amazon and Best Buy, offer extra product protection plans for these products. They usually offer it as you are ordering your product. Whether it’s to heat water for some aching muscles or for the perfect cup of tea, the electric kettles are a great appliance to have in any home. And it won’t leave you waiting forever for your water to boil.